When Andrew Luck missed the entire 2017 season, Jacoby Brissett ended up becoming the Colts’ starter after they acquired him from New England, and he filled in admirably. He’s remained in Indianapolis since then, despite trade rumors swirling ever since. Colts GM Chris Ballard said in January that the team viewed Brissett as a starter in the league, and that they’d have to be blown away to trade him. We now have more details on their thinking, as sources at the combine told Tony Pauline of Draftanalyst.com that the Colts “would demand a second-round choice ” for Brissett. Pauline further explained their process, writing that if Brissett walks in free agency after this season the Colts think “they would likely receive a compensatory third-round pick based on the contract he’s likely to sign; hence the second-round price tag.” This could all just be posturing to elicit better offers for Brissett, but it definitely seems like the team is high on him. The Falcons have repeatedly expressed confidence that they’d be able to get a new deal done with Julio Jones, but there’s “not much going on” between the two sides, a source told Vaughn McClure of ESPN.com (Twitter link). Jones is locked into a contract that is one of the best bargains in the NFL, and isn’t happy about it. 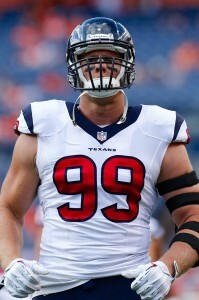 He briefly held out last offseason before the team sweetened his deal with some incentives to draw him back. As McClure points out, GM Thomas Dimitroff has said the team is optimistic against getting a deal done, but there’s apparently been no progress. Jones could hold out again this summer, and it’ll be something to keep an eye on. There were some rumors online that the Buccaneers could be shopping linebacker Lavonte David at the combine, but those apparently are false. Multiple sources told Jenna Laine of ESPN.com that David “is going nowhere.” David is still only 29 and received very good marks from Pro Football Focus last year, so it makes sense that the Bucs would want to keep him in the fold as they rebuild their porous defense. The Saints are hiring former NFL linebacker Michael Wilhoite to their coaching staff, according to Josh Katzenstein of NOLA.com. Wilhoite will be a special teams assistant in New Orleans. Wilhoite played six seasons in the NFL from ’12-17, spending time with the 49ers and Seahawks. Buccaneers linebacker Lavonte David does not have a high-ankle sprain as originally reported, as in fact only dealing with a medial left ankle sprain which will render him week-to-week, according to Jenna Laine of ESPN.com. Head coach Dirk Koetter hinted at as much when speaking to reporters earlier today, as Rick Stroud of the Tampa Bay Times writes. If he’s forced to miss time, the 27-year-old David will undoubtedly be missed. Through three games, David was ranked as Pro Football Focus’ No. 2 linebacker in the NFL. Though it comes from a small sample size, his 88.1 score is exceptional and nearly as strong as his career-high 93.5 score in 2013. The 2013 season marked his sole first-team All Pro selection. Last year, David had a perfect attendance record as he tallied 87 tackles, 5.0 sacks, and four forced fumbles. He also had an interception, the tenth of his career. A hamstring injury also kept starting linebacker Kwon Alexander out of action on Sunday. If Alexander cannot go on Sunday, the Bucs could be a bit thin in the front seven when they face the Giants. The Buccaneers could be without Lavonte David for the near future. The cornerstone defender suffered what’s believed to be a high ankle sprain in Tampa Bay’s loss to the Vikings on Sunday, Ian Rapoport of NFL.com tweets. David will undergo an MRI Monday morning, which will lead to a clearer timetable. But given the nature of this injury, it’s likely the stalwart outside linebacker misses some time. Should David miss games because of this malady, they will mark his first absences since the 2014 season. David missed two games that year. During his other four NFL seasons, the former second-round pick suited up for all 16 Bucs contests. A hamstring injury sidelined David in 2014. A former first-team All-Pro, David made seven tackles in Tampa Bay’s Week 3 defeat. A cart transported the sixth-year defender to the locker room. Worries about a knee injury swirled after the seminal sequence, but it appears David’s dodged a season-ending setback. The Bucs were already playing without fellow standout ‘backer Kwon Alexander. Rookie Kendell Beckwith started in the middle for Alexander, who missed the Vikings matchup with a hamstring injury. So, Tampa’s defensive second level is reeling at the moment. Ryan Tannehill, quarterback (Dolphins): $3.5MM of $17.975MM base salary for 2017 is guaranteed. Dez Bryant, wide receiver (Cowboys): $13MM base salary for 2017 is guaranteed. T.Y. Hilton, wide receiver (Colts): $3MM base salary for 2016 is guaranteed. $6MM roster bonus now payable. Anthony Castonzo, offensive tackle (Colts): $2.5MM base salary for 2016 is guaranteed. $4.5MM roster bonus now payable. Tyron Smith, offensive tackle (Cowboys): $10MM base salary for 2016 is guaranteed. Branden Albert, offensive tackle (Dolphins): $6MM of $8.245MM base salary for 2017 is guaranteed. Mike Pouncey, center (Dolphins): $9MM base salary for 2016 is guaranteed, as is $2MM of Pouncey’s $7.95MM base salary in 2017. Maurkice Pouncey, center (Steelers): $3.5MM roster bonus now payable. Cameron Heyward, defensive end (Steelers): $5MM roster bonus now payable. J.J. Watt, defensive end (Texans): $10.5MM base salaries for 2016 and 2017 are guaranteed. Robert Quinn, defensive end (Rams): $7,777,777MM base salary for 2016 is guaranteed. Lavonte David, linebacker (Buccaneers): $5MM base salary for 2016 is guaranteed. Chris Harris Jr., cornerback (Broncos): $6.9MM base salary for 2016 is guaranteed. Here’s a look at the NFC South, where the newest member of the Buccaneers‘ defensive line could be recruiting a Seahawks notable to Tampa Bay..
New Buccaneers defensive tackle Tony McDaniel says that former teammate Michael Bennett wants to return to Tampa Bay, as JoeBucsFan.com writes. “I told him about, you know, I told him about some of the teams that were offering me and he said Tampa was a great place, and he even said he wishes he could come back down here. But yeah, he kind of helped sell me to come down here to Tampa and play,” said McDaniel, who also vowed to get Bennett back to the Bucs. Bennett is currently embroiled in a contract dispute with the Seahawks but he also has multiple years to go on his deal. Joel Corry of CBSSports.com passes along a few details on the Buccaneers‘ new “pay-as-you-go” extension with Lavonte David, reporting that the deal increases David’s cap hit for 2015 due to a roster bonus that will be paid this week, and features annual escalators for Pro Bowl or first-team All-Pro nods (all Twitter links). Former Missouri cornerback Kevin Rutland, a former Jaguars player, worked out for the Falcons, a source tells Aaron Wilson of the National Football Post (on Twitter). 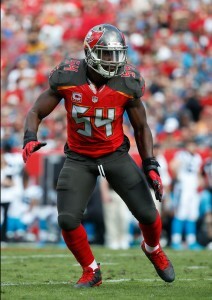 The Buccaneers have signed linebacker Lavonte David to a five-year, $50.25MM extension, the club announced. $25.56MM of the deal is guaranteed. David is now locked up through the 2020 season. Talks between David and Tampa Bay had been heating up, but Getlin reported near the end of July that there was still a sizable gap between the two sides. As of last Wednesday, David and the Bucs were said to be “not close” in negotiations, with reports indicating that fellow outside linebacker DeAndre Levy‘s recent extension with the Lions would play a large role in discussions. Assuming that the $50.25MM figure is in reference to new money — and doesn’t include David’s 2015 compensation — David will the new high-earner among 4-3 outside linebackers. His $10.05MM average annual value will be more than $1.5MM larger per year than that of Levy, who was the top earner at the position for about a week. Per Ian Rapoport of NFL.com (Twitter link), David’s target in contract talks was Patrick Willis‘ $10MM per year. David not only match that figure, but narrowly eclipsed it, and he’ll not only become the highest-paid among OLBs, but he’ll rank fourth among all linebackers, accounting even for 3-4 pass-rushers. Justin Houston, Clay Matthews, and Ryan Kerrigan are the only ‘backers with larger AAVs than David. We’ll probably have to wait for the fully guaranteed portion of the deal — the $25.56MM number is likely guaranteed for injury only — but David figures to top Levy in that regard, as well. Levy received $13MM in full guarantees as a part of his $33.74MM extension. If David is able to match that percentage-wise, he should be looking at about $19.5MM in fully guaranteed money. The 25-year-old David has been among the best linebackers in the league since being selected in the second round of the 2012 draft. The Nebraska alum has started 46 out of a possible 48 games for the Buccaneers, posting more than 100 tackles in each season. In 2014, David ranked as the No. 7 4-3 OLB in the NFL, according to Pro Football Focus (subscription required) — he finished sixth and second, respectively, in 2012 and 2013. David becomes the second key member of Tampa’s defense to earn a long-term extension, joining defensive tackle Gerald McCoy, who was drafted two years ahead of David. McCoy agreed to a seven-year, $98MM deal last October, meaning that the two defensive stalwarts are both locked up for the foreseeable future: David through 2020, McCoy through 2021. Rand Getlin of the NFL Network (Twitter link) reported that the two sides had a struck a deal, and indicated that the length of the pact. Ian Rapoport of NFL.com (Twitter link) reported the total value and the guarantee. Photo courtesy of USA Today Sports Images. It’s been an eventful year for cornerback Alfonzo Dennard, who received a raise for 2015 and won a Super Bowl with the Patriots within the first few weeks of the year. However, since then, he’s been cut twice, by the Pats and Cardinals, negating that non-guaranteed raise that he earned back in January. Currently, Dennard is a free agent, and Josina Anderson of ESPN.com reports (via Twitter) that he’s working out for the Saints today. Dennard missed 10 regular season contests in 2014, as he was plagued throughout the season by shoulder and hamstring issues. In New Orleans, he could help provide depth for a secondary that’s banged up early in training camp — cornerbacks Keenan Lewis and Delvin Breaux were among the players absent from the team’s walkthrough on Wednesday. 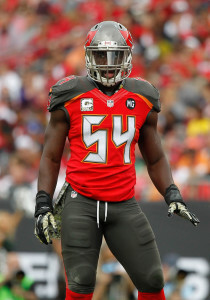 Buccaneers linebacker Lavonte David will likely be keeping a close eye on the financial terms for DeAndre Levy‘s new extension with the Lions, since David figures to surpass Levy’s deal. According to Anderson (via Twitter), the Bucs and David were “still not close” to working out a new contract as of Wednesday morning. Pierre Thomas and the Texans could revisit a deal, even though there’s no pact at this time, writes Aaron Wilson of the Houston Chronicle. Wilson, who says Houston offered Thomas a minimum-salary contract, indicates that the two sides will likely remain in touch, since the former Saint was “clearly” the Texans’ preferred choice of the backs that auditioned for the team. Former Patriots and Rutgers linebacker Steve Beauharnais worked out for the Colts on Wednesday, a source tells Wilson (Twitter link). The 25-year-old saw a little regular season action with Washington in 2014. Let’s take a look at how Bobby Wagner‘s new four-year, $43MM deal impacts his club and several other teams with linebackers anticipating a new contract. ESPN’s Andrew Brandt tweets that the Seahawks structured Russell Wilson‘s extension to give them maximum salary cap room for this season, thereby allowing them to sign Wagner to a long-term contract. As such, the team will probably need Wilson to restructure his deal a couple years from now. Wagner made some waves on Friday when he tweeted “Can’t keep everyone.” As former NFL agent Joel Corry tweets, that message may end up applying to Seattle left tackle Russell Okung, whose contract expires at the end of this year. Bruce Irvin, who is also eligible for unrestricted free agency at the end of 2015, may also be playing his last year in a Seahawks uniform. The Wagner extension has inevitably called attention to the contract situations of Kam Chancellor and Michael Bennett, who are both unhappy with their current deals (Chancellor, of course, has decided to hold out of training camp). Corry tweets that, if the Seahawks address Chancellor’s contract, it would “create an issue” with Bennett. Chancellor does have three years left on his contract, so should the Seahawks rework his deal in any way, Corry tweets that Richard Sherman and Earl Thomas will both expect the same treatment in 2016. Bob Condotta of The Seattle Times believes the Seahawks will likely want to keep guard J.R. Sweezy, who is playing in the last year of his contract, but it is too early to say how the team will approach impending free agent punter Jon Ryan (Twitter links). Rand Getlin of the NFL Network tweets that the Wagner deal was “always going to inform the Lavonte David deal,” a sentiment shared by several other prominent scribes. Jason Fitzgerald of OverTheCap.com, though, is not so sure. Fitzgerald points out (via Twitter) that David and Wagner play completely different positions and that David, as a non-pass rushing outside linebacker, is likely to land around $3MM less per season than Wagner. In any event, Getlin tweets that David and the Bucs will continue to talk over the coming days, and both sides are reportedly motivated to strike a deal. Corry tweets that Tampa Bay prefers contracts longer than four years when it comes to extending its best players, so that may be what the team is aiming for with David. DeAndre Levy, who is eligible for unrestricted free agency at the end of this season, saw Wagner’s deal and hopes to remain with the Lions, but he said he will leave all contract talk to his agent (Twitter link via Dave Birkett of The Detroit Free Press).